Glasgow Warriors centre Huw Jones is likely to miss the rest of Scotland's Six Nations campaign. It follows news that club-mate Stuart Hogg is struggling to be involved in the tournament again after damaging shoulder ligaments against Ireland. The 25-year-old Jones suffered knee ligament damage as he earned a 17th cap in Saturday's loss at Murrayfield. "The injury recovery time would likely be beyond the reaches of the current campaign," Scottish Rugby has stated. Like Jones, Hogg has undergone a scan for his injury, but the governing body has not given a timescale for the 26-year-old's recovery. 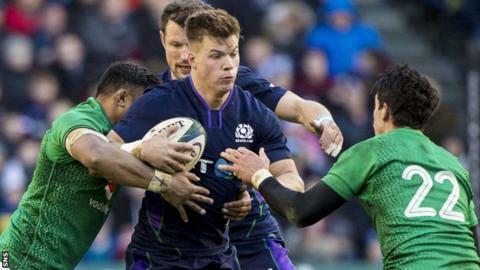 Head coach Gregor Townsend had on Wednesday contradicted a newspaper report suggesting Hogg could miss the rest of the season by saying he remained "very hopeful" the full-back could play some part in the Six Nations campaign. Scottish Rugby stated that he "is now under the joint care of the Glasgow Warriors and Scotland medical teams, with his rehabilitation progress and review ongoing". However, it stressed that Jones is "unlikely to play any further part" with games to come against France, Wales and England.